George Grosz was an ideologically committed painter, an agitator who used art as a weapon in the convulsed Germany of the early twentieth century. He studied at the Akademie für Bildende Künste in Dresden between 1909 and 1911, at the Kunstgewerbeschule in Berlin and, finally, at the Académie Colarossi in Paris in 1913. Grosz started out as a caricature artist with a socially critical style that became more mordant as a result of the traumatic experience of the First World War. In 1917 he and the brothers John Heartfield and Wieland Herzfelde established Malik, a publishing firm specialising in subversive books and reviews, where Grosz brought out numerous drawings and a few writings which occasionally led him to court. From 1917 to 1920, driven by his disillusionment with the society that surrounded him, he joined the Berlin Dadaist group and took part with Heartfield and Otto Dix in the Erste Internationale Dada-Messe of 1920. Shortly afterwards he became the foremost practitioner of the Neue Sachlichkeit (New Objectivity). During the 1920s Grosz’s artistic style expressed his disgust with postwar Germany. The modern metropolis became the recurring theme of his work and, like a contemporary Bosch with an incisive critical tone and keen sense of observation, he captured his surrounding environment in works with a moralising intent. He was perhaps the artist who provided the most reliable chronicle of 1920s Berlin. 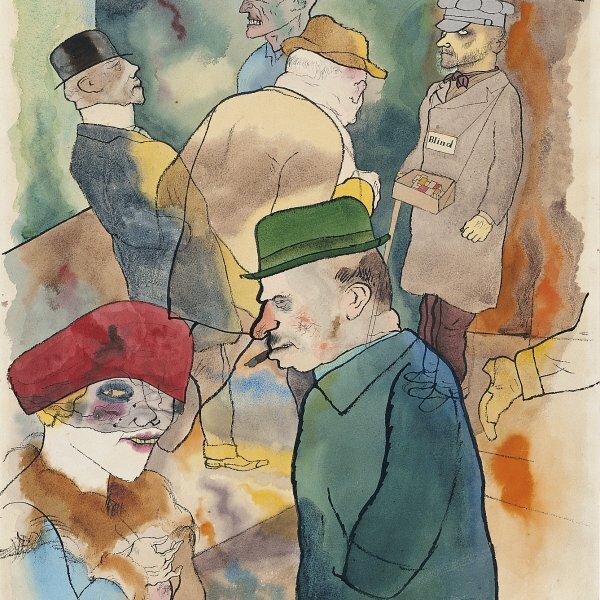 Nowadays one of the main images we have of Weimar Republic Germany is that which Grosz has left us with his biting caricatures and mastery at capturing life in the streets of Berlin. Grosz’s fame began to spread internationally and he was soon hailed as one of the leading German artists. Alfred Flechtheim became his dealer in 1925 and he was invited to be a guest lecturer at the New York Art Students League in 1932. Following the advent to power of the National Socialist party, he settled permanently in the United States in 1933, although he returned to Berlin shortly before dying. After being refused a German passport, he adopted American citizenship in 1938.